Lambda Tau Upsilon Christian Sorority strictly forbids hazing! 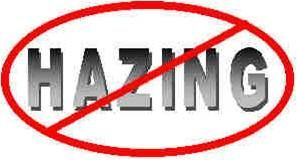 Our policy on hazing is very simple: We do not tolerate it! Therefore, we reaffirm our opposition to hazing, and we subscribe in policy and practice to the following statements. No Chapter or member shall conduct nor condone hazing activities. Any action taken or situation created, intentionally, whether on or off sorority premises, to produce mental or physical discomfort, embarrassment, harassment, or ridicule. Such activities may include but are not limited to the following: use of alcohol; paddling in any form; creation of excessive fatigue; physical and psychological shocks; quests, treasure hunts, scavenger hunts, road trips, or any other such activities carried on an outside or inside of the confines of the chapter house; wearing public apparel which is conspicuous and not normally in good taste; engaging in public stunts and buffoonery; morally degrading or humiliating games and activities; and any other activities which are not consistent with moral, spiritual, academic achievement, fraternal law, ritual, or policy or the regulations and policies of the sorority, or applicable state or Federal law.